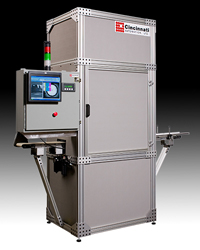 CA designed and built this system to be used to gage ID and OD surfaces of automotive gears. The system utilized a high resolution Cognex Camera with LED top lighting above a part transfer conveyor. The cabinet was designed for installation in a dusty plant environment. It included sealed plastic cover panels and air purge to minimize foreign matter on parts.